I thought, "Wait a minute! This website is "the definitive guide to swing trading!" And then I thought, "What could this guy (his name is Kevin) tell me about swing trading that I don't already know?" But I was intrigued by the offer since it came with some free trading software. More on that in a minute. In a hurry? Download some sample chapters now. I liked Kevin right from the start and I could tell right away that he was part of the "keeping it real" crowd. I wasn't going to get any hype. And, I could tell that he wasn't going to insult my intelligence by showing me a bunch of "theories" that would never work in the real world. There are so many trading offers out there that supposedly have "little-known" or "secret formulas" for finding profitable stock trades. Here's the most profitable secret you need to know...NO trading method that is "secret" or "little-known" will work. You must come to understand that the very premise of making a profit is making trades (long or short) that everyone else trading. Now think about this. If it's "secret" then very few traders are using it. It takes more than a few traders to move a stock price. I have actually encountered a trader that gets it. After I read that, I became excited to read the rest of the book. After the introduction, this book starts out with the basics of trading. If you are new to trading, you will find this helpful. If you have been trading for awhile, you can skip over this section. The rest of the book is where it starts to get good. He talks about trading system optimization, his criteria for choosing stocks, and how to build a solid watch list. There is also a chapter on identifying and trading pivot points which is different from the way that I look at them. This trading system uses 2 technical indicators on candlestick charts. As you know, I'm not a big fan of technical indicators so I probably won't use these. But I like how Kevin doesn't use them to make buy and sell decisions. He uses them to confirm a move and he has a unique way of applying different time frames to one indicator. If you use technical indicators on your charts, then you will appreciate this section. Included in the book is a method of finding hidden support and resistance levels that is trademarked and cannot be found anywhere else on the net. Your purchased guide contains trading methods developed by others as well as those I have personally developed and trademarked and can't be found anywhere else. If you can find any of my trademarked methods elsewhere I will gladly refund your purchase. This method of finding hidden support and resistance is called Swing Trade Levels™. And it is based on the concept that the highest probability lies in price movements between 2 and 5 percent. 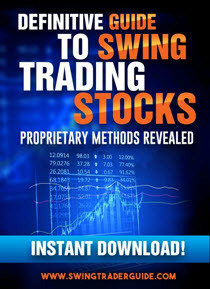 There are quite a few other gems in the book including lots of risk control measures to take, a unique exit strategy using moving averages, and a trading checklist for the entire trading system. This checklist is helpful if you want to use the system in its entirety. The one thing I didn't like about the e-book is that there is only one example trade in the book. I really wish he would have included more examples to help solidify the methods presented. Maybe he will add some more trading examples in the future (you get free updates when you buy the book). Update 2017: In the new version, Kevin has included many more trading examples. This software program calculates position size (with different models), has a trade planner to document your trades, and has a trading simulator that shows the equity curve of your trading system. It can also project profits based on earnings estimates. This is a handy calculator to have on your desktop for any trader. Was it worth the money? Yes, I think so. Kevin trades very similar to the way I trade so of course I really enjoyed this eBook. And never in a million years did I think that I would learn some new concepts that I could incorporate into my trading. That made it worth every penny. Learn more about Kevin's swing trading strategy here.